Meyn and Tweedie is back! The bible on Markov chains in general state spaces has been brought up to date to reflect developments in the field since 1996 - many of them sparked by publication of the first edition. The pursuit of more efficient simulation algorithms for complex Markovian models, or algorithms for computation of optimal policies for controlled Markov models, has opened new directions for research on Markov chains. As a result, new applications have emerged across a wide range of topics including optimisation, statistics, and economics. New commentary and an epilogue by Sean Meyn summarise recent developments and references have been fully updated. This second edition reflects the same discipline and style that marked out the original and helped it to become a classic: proofs are rigorous and concise, the range of applications is broad and knowledgeable, and key ideas are accessible to practitioners with limited mathematical background. List of figures; Prologue to the second edition Peter W. Glynn; Preface to the second edition Sean Meyn; Preface to the first edition; Part I. Communication and Regeneration: 1. Heuristics; 2. Markov models; 3. Transition probabilities; 4. Irreducibility; 5. Pseudo-atoms; 6. Topology and continuity; 7. The nonlinear state space model; Part II. Stability Structures: 8. Transience and recurrence; 9. Harris and topological recurrence; 10. The existence of ; 11. Drift and regularity; 12. Invariance and tightness; Part III. Convergence: 13. Ergodicity; 14. f-Ergodicity and f-regularity; 15. Geometric ergodicity; 16. V-Uniform ergodicity; 17. Sample paths and limit theorems; 18. Positivity; 19. Generalized classification criteria; 20. Epilogue to the second edition; Part IV. Appendices: A. Mud maps; B. Testing for stability; C. Glossary of model assumptions; D. Some mathematical background; Bibliography; Indexes. 'This second edition remains true to the remarkable standards of scholarship established by the first edition ... it will no doubt be a very welcome addition to the literature.' Peter W. Glynn, Prologue to the Second Edition "As Glynn puts it in his prologue, "This second edition remains true to the remarkable standards of scholarship established by the first edition... This new edition does a splendid job of making clear the most important [new] developments and pointing the reader in the direction of key references to be studied in each area." The reviewer fully agrees with this assessment." 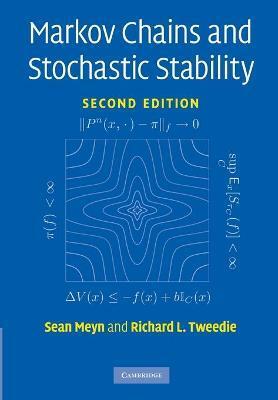 M. Iosifescu, Mathematical Reviews "The second edition of Meyn and Tweedie's Markov Chains and Stochastic Stability is out. This is great news. If you do not have this book yet, you should hurry up and get yourself a copy at a very reasonable price, and if you do own a copy already, it is probably falling apart by now from frequent use, so upgrade to the second edition." Sean Meyn is a professor in the Department of Electrical and Computer Engineering and director of the Division and Control Laboratory of the Coordinated Science Laboratory at the University of Illinois. He has served on the editorial boards of several journals in areas of systems and control and applied probability. Richard L. Tweedie was Professor and Head of the Division of Biostatistics at the University of Minnesota before his death in 2001.